The Super Fun Quirk Quiz, or the Annual Quirk Quiz, is a series of two quizzes that appear in Paper Mario: The Thousand-Year Door. There are two versions of this quiz in the game, one being held in Shhwonk Fortress, and the other in the X-Naut Fortress. Mario is a contestant at both of these quizzes. Both are run by Thwomps - one being a normal Thwomp, and the other being a robotic Thwomp. In either case, they both get mad when their respective quiz is completed. This quiz is held in Shhwonk Fortress, right outside the entrance. Mario triggers this quiz by pressing when near the Thwomp, and when he does, the Thwomp will open its eyes and start the quiz. If the player gets three wrong they have to fight four Clefts. This quiz is found in X-Naut Fortress. The robotic Thwomp's questions require the player to remember details of all the events that Mario has been through on his journey. If the player gets three wrong they have to fight two X-Yux. The "Race in a Kart" answer is a reference to the Mario Kart series. 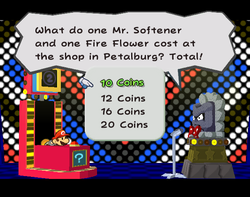 The "Super Question 64" is a reference to Super Mario 64. The fact that the quizzes Mario encounters are the 65th and the 66th is a reference to the first Paper Mario's quiz show, the 64th Trivia Quiz-Off. This page was last edited on September 16, 2018, at 01:23.